NOTE: Это очень странный альбом. Наверное, самый странный из всех альбомов проекта и самый дадаистский по духу, учитывая, что оба соавтора дуэта активные участники авангардного арт- и литературного процессов в России и Европе. 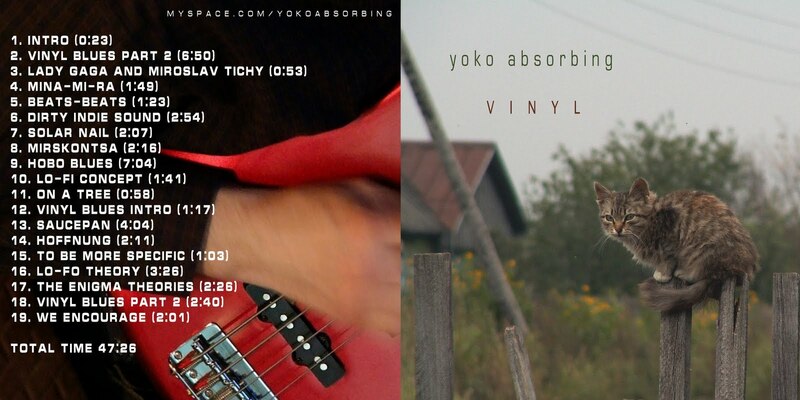 В основе творчества Yoko Absorbing абсолютная спонтанность в написании музыки. Мы пытаемся подчинить этот процесс жесткой драматурги, но лишь на финальной стадии работы – в период сведения всего материала. В записи данного альбома, помимо работы с инструментами в студиях и сэмплами на компьютерах, мы во множестве использовали обрывки старых пленочных записей с репетиций наших прошлых рок-проектов (80-90-х годов), а так же звуки виниловых пластинок. Это альбом-ностальгия, поэтому и назвали просто и незатейливо “Vinyl”. Стиль сложно определить. Весь 47-минутный альбом - этакий коллаж из киномузыки, поп-фанка, блюза, фри-джаза, музыки "конкрет" и минималистских пост-панк выкрутасов. В итоге – некий абсолют Дадаизма, организованная эклектика. Yoko Absorbing are the minds of Evgenij V. Kharitonov (music, samples, guitars, keyboards, percussion, sounds) and Mikhail Lezin (music, samples, guitars, bass, keyboards, percussion, sounds), who combine their own creations and unite with other musicians to create something where the fine line between real instrumentation and samples are blurred. Vinyl (Clinical Archives) couldn’t be a more appropriate titles, for this is the kind of music that is perfect for the sample-included and funk driven music fan who love to hear loops upon loops upon samples upon chops upon who knows what. Some songs move on in a place that might work on the dance floor of the lunatic, while others move as if it was progressive rock, but without the rock. Okay, so there are guitars but it sounds more like Mike Oldfield than anything of the Clapton/Page/Beck variety. Sounds begin, stop, suspend itself, and curl over each other, starting out gentle before throwing pelican drats in a mutated metal delivery. Don’t expect to feel spirited as if this music will save you, but perhaps it will. Instead, take the music as it comes and be prepared to slip off the wagon whenever it feels like pushing you. When it’s on a rhythmic adventure, it takes itself to all new levels, but it takes a liking to itself when it moves into corners unknown. This is when Yoko Absorbing are taking in everything through their pores, eyes wide open, nowhere to hide. Experimental electronic music isn’t for everyone, but if it is for you, soak in its fermented warmth. So as not to wake the animals. Dadaism arose as a response to the “benefits” of logical, Western culture before WWI. The sense of pleasantly illogical behavior offered by our three new Russian works is nothing like the willful epatage of that original movement - and heaven knows how far it is from the nation’s most famous instrumentals, mentioned above and fashioned ten years ago in better economic climes. The new “movie soundtracks” that Kharitonov refers to are designed for personal downloading, not public performance. So what kind of respite do they offer from the outside world? What better narrative or personal story do they score? Nailer, “Tree, Bosier,” and Yoko Absorbing work hand in hand to accompany desirable thoughts of sentimental retrospection to one’s childhood - and slumber. Nailer’s cover art shows a boy pondering adult effort at a distance - with no apparent desire to join in; Kharitonov’s profoundly Russian cover displays a homeless cat doing absolutely nothing on a ramshackle dacha fence. Both evoke silence, simplicity, and solitude. All three of these instrumentals look lovingly at that state of peace and quiet, because it’s currently in short supply. Which leaves us with the conclusion that these new albums are designed as IPod soundtracks for slow, quiet walks in no particular direction, just before bed. Better still, take an umbrella when it’s not raining. My first experience with the Clinical Archives netlabel has been through the group Yoko Absorbing, a duo of multi-instrumentalists. Their Vinyl album is an intriguing collection of songs that explore the push and pull between electronic and acoustic sounds, loops and live instrumentation. Their more abrasive side is on display with tunes like "Hoffnung" and "To Be More Specific," almost industrial in discipline. "Vinyl Blues Part 1" lies in stark contrast, sounding like a live house band steeped in disco and funk that occasionally gets in touch with their inner Sonic Youth and feels the need to throw some feedback into the mix. 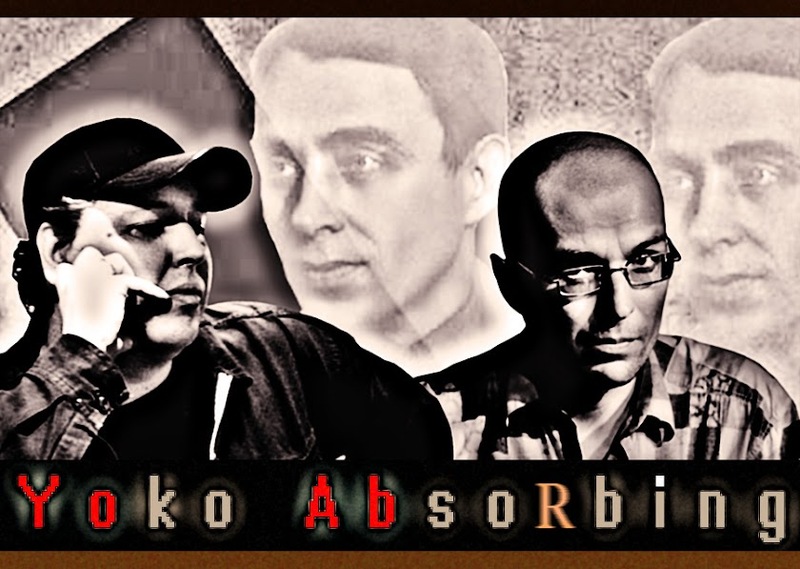 The project YOKO ABSORBING was created on spring 2008 in Russia by two avant-garde artists: poet, sound-poet and musician Evgenij V. Kharitonov [aka EugeneKha] (Moscow) and artist, musician and poet Mikhail Lezin (Togliatti). Creative work of YOKO ABSORBING embraces the whole of experimental music: noise pop, concrete, free jazz, prog-rock, post-rock, free improvisation, electro acoustic, audio collage etc.